This article presents a number of methodologies that have been suggested for the task of comparing the greatest chess players in history. Statistical methods offer objectivity but, while there is agreement on systems to rate the strengths of current players, there is disagreement on whether such techniques can be applied to players from different generations who never competed against each other. In 1970, FIDE adopted Elo's system for rating current players, so one way to compare players of different eras is to compare their Elo ratings. The best-ever Elo ratings are tabulated below. As of December 2015, there were 101 chess players in history who broke 2700 and thirteen of them exceeded 2800. Particularly notable are the peak ratings of Fischer, Karpov and Kasparov, who achieved their peak ratings in earlier years (1972, 1994, and 1999 respectively). The average Elo rating of top players has risen over time. For instance, the average of the top 10 active players rose from 2751 in July 2000 to 2794 in July 2014, a 43-point increase in 14 years. The average rating of the top 100 players, meanwhile, increased from 2644 to 2703, a 59-point increase. Many people believe that this rise is mostly due to a system artifact known as ratings inflation, making it impractical to compare players of different eras. Arpad Elo was of the opinion that it was futile to attempt to use ratings to compare players from different eras; in his view, they could only possibly measure the strength of a player as compared to his or her contemporaries. He also stated that the process of rating players was in any case rather approximate; he compared it to "the measurement of the position of a cork bobbing up and down on the surface of agitated water with a yard stick tied to a rope and which is swaying in the wind". Many statisticians besides Elo have devised similar methods to retrospectively rate players. Jeff Sonas' rating system is called "Chessmetrics". This system takes account of many games played after the publication of Elo's book, and claims to take account of the rating inflation that the Elo system has allegedly suffered. One caveat is that a Chessmetrics rating takes into account the frequency of play. According to Sonas, "As soon as you go a month without playing, your Chessmetrics rating will start to drop." Of course, a rating always indicates the level of dominance of a particular player against contemporary peers; it says nothing about whether the player is stronger/weaker in their actual technical chess skill than a player far removed from them in time. So while we cannot say that Bobby Fischer in the early 1970s or José Capablanca in the early 1920s were the "strongest" players of all time, we can say with a certain amount of confidence that they were the two most dominant players of all time. That is the extent of what these ratings can tell us. These "Divinsky numbers" are not on the same scale as Elo ratings (the last person on the list, Johannes Zukertort, has a Divinsky number of 873, which would be a beginner-level Elo rating). Keene and Divinsky's system has met with limited acceptance, and Warriors of the Mind has been accused of arbitrarily selecting players and bias towards modern players. A computer-based method of analyzing chess abilities across history came from Matej Guid and Ivan Bratko from the Department of Computer and Information Science of University of Ljubljana, Slovenia, in 2006. The basis for their evaluation was the difference between the position values resulting from the moves played by the human chess player and the moves chosen as best by the chess program Crafty. They compared the average number of errors in the player's game. Opening moves were excluded, in an attempt to negate the progress in chess opening theory. The method received a number of criticisms, including: the study used a modified version of Crafty rather than the standard version; even the standard version of Crafty was not strong enough to evaluate the world champions' play; one of the modifications restricted the search depth to 12 half-moves, which is often insufficient. 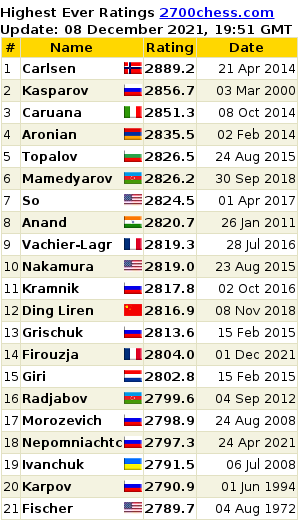 As of 2006 Crafty's Elo rating was 2657, below many historical top human players and several other computer programs. A study by online chess data provider Chess-DB, based on an analysis of over 50,000 chess games, claims that the "strength" of a player, as determined by the method of Matej Guid and Ivan Bratko, correlates with the Elo rating strength of modern players. A 2008 analysis, using Rybka 3, showed that Capablanca had the smallest average error factor (i.e. the most accurate play); but after adjusting for factors such as the complexity of positions, the best player came out as Fischer, followed by Capablanca, Karpov and Kramnik. The best players had an average error of about 0.07 pawns per move (after the opening). Capablanca was the most positional player, and Anand by far the most tactical. The most complex game tested was Fischer v Spassky (1972 game 6, Fischer won) while the most accurately played game was Tal v Benko (1958, Tal won). CAPS (Computer Aggregated Precision Score) is a system created by Chess.com that compares players from different eras by finding the percentage of moves that matches that of a chess engine. A score is then assigned based on percentage of matches and move value (for example, if the move was not the best, but still good, points are awarded). CAPS ignores both style and psychology. According to the system, Carlsen was the best player ever, with a CAPS score of 98.36 and a top engine match of 85.26%. He was followed closely by Kramnik, and then Kasparov. The complete results are as follows (each player taken in his best year, Carlsen: 2013, Kramnik: 1999, Fischer: 1971, Kasparov: 2001, Anand: 2008, Khalifman: 2010, Smyslov: 1983, Petrosian: 1962, Karpov: 1988, Kasimdzhanov: 2011, Botvinnik: 1945, Ponomariov: 2011, Lasker: 1907, Spassky: 1970, Topalov: 2008, Capablanca: 1928, Euwe: 1941, Tal: 1981, Alekhine: 1922, Steinitz: 1894). The numbers represent the winning percentage of one player against his opponent. Tables are not symmetric as playing with white and with black is not the same. The complete database of the chess games and their evaluations can be downloaded from the page presenting this work on the author's website. Many prominent players and chess writers have offered their own rankings of players. In 1964, Bobby Fischer listed his top 10 in Chessworld magazine: Morphy, Staunton, Steinitz, Tarrasch, Chigorin, Alekhine, Capablanca, Spassky, Tal, Reshevsky. He considered Morphy to be "perhaps the most accurate", writing: "In a set match he would beat anyone alive today." In 1970, Fischer named Morphy, Steinitz, Capablanca, Botvinnik, Petrosian, Tal, Spassky, Reshevsky, Svetozar Gligorić and Bent Larsen the greatest chess players in history. In 1974, popular chess author Irving Chernev published an article titled Who were the greatest? in the English magazine CHESS. He followed this up with his 1976 book The Golden Dozen, in which he ranked his all-time top twelve: 1. Capablanca, 2. Alekhine, 3. Lasker, 4. Fischer, 5. Botvinnik, 6. Petrosian, 7. Tal, 8. Smyslov, 9. Spassky, 10. Bronstein, 11. Rubinstein, and 12. Nimzowitsch. In a 1992 interview GM Miguel Quinteros gave the opinion: "I think Fischer was and still is the greatest chess player of all time. [...] During his absence other good chess players have appeared. But no one equals Fischer's talent and perfection." In 2000, when Karpov, Korchnoi and Kasparov were still active, Anand listed his top 10 as: Fischer, Morphy, Lasker, Capablanca, Steinitz, Tal, Korchnoi, Keres, Karpov and Kasparov. When interviewed in 2008 shortly after Fischer's death, he ranked Fischer and Kasparov as the greatest, with Kasparov a little ahead by virtue of being on top for so many years. In 2012, Anand stated that he considered Fischer the best player and also the greatest, because of the hurdles he faced. At the beginning of 2001 a large poll for the "Ten Greatest Chess Players of the 20th Century, selected by Chess Informant readers" resulted in Fischer having the highest percentage of votes and finishing as No. 1, ahead of Kasparov, Alekhine, Capablanca, Botvinnik, Karpov, Tal, Lasker, Anand and Korchnoi. Fischer, some will maintain, was the outstanding player in chess history, though there are powerful advocates too for Lasker, Capablanca, Alekhine, and Kasparov. Many chess players will dismiss such comparisons as meaningless, akin to the futile attempt to grade the supreme musicians of all time. But the manner in which Fischer stormed his way to Reykjavik, his breathtaking dominance at the Palma de Majorca Interzonal, the trouncings of Taimanov, Larsen, and Petrosian—all this was unprecedented. There never has been an era in modern chess during which one player has so overshadowed all others. In a 2005 interview, Vladimir Kramnik (World Champion from 2000 to 2007) did not name a greatest player, but stated, "The other world champions had something 'missing'. I can't say the same about Kasparov: he can do everything." In an interview in 2011, Vladimir Kramnik said about Anand: "I always considered him to be a colossal talent, one of the greatest in the whole history of chess", "I think that in terms of play Anand is in no way weaker than Kasparov", and "In the last 5–6 years he's made a qualitative leap that's made it possible to consider him one of the great chess players". In his 2008 obituary of Bobby Fischer, Leonard Barden wrote that most experts ranked Kasparov as the best ever player, with probably Fischer second and Karpov third. In a 2012 interview, Levon Aronian stated that he considers Alexander Alekhine the best player of all time. In a 2015 interview after the 8th round of the Sinquefield Cup, Levon Aronian stated that he considers Garry Kasparov the strongest player of all time. In 2012, Magnus Carlsen said that Kasparov is the greatest player of all time, adding that while Fischer may have been better at his best, Kasparov remained at the top for much longer. In December 2015, he repeated his great respect for both Fischer and Kasparov when he mentioned them several times in an interview, saying he would like to play against them at their peak performance. Also, he said he liked the style of play and games of Vladimir Kramnik. As the toughest opponent to beat at that time he named Levon Aronian. The table below organises the world champions in order of championship wins. (For the purpose of this table, a successful defence counts as a win, even if the match was drawn.) The table is made more complicated by the split between the "Classical" and FIDE world titles between 1993 and 2006. Wikimedia Commons has media related to Chess players. ^ Arpad E. Elo, The Rating of Chessplayers, Past and Present, Arco, 1978. ISBN 0-668-04721-6. ^ This table is based on one created by Przemek Jahr of Poland, which was reported in Chessbase 2-7-2005. FIDE ratings were officially compiled and released quarterly, in January, April, July, and October until July 2009. Starting in July 2009 they were released every two-monthly basis, and since July 2012 FIDE publishes its ratings monthly. ^ Administrator. "Highest-Rated Chess Players of All Time". ^ "All time Top 100 by Highest Elo Rating". ^ "Live Chess Ratings – 2700chess.com". ^ "Live Elo" covers rating achieved after every single chess game played, what constitutes live performance of players in between of FIDE's regular monthly rating lists. ^ "ChessBase News | Rating inflation – its causes and possible cures". Chessbase.com. 27 July 2009. Retrieved 21 October 2013. ^ "Peak Average Ratings: 1 year peak range". Archived from the original on 9 March 2012. ^ "Peak Average Ratings: 5 year peak range". Archived from the original on 9 March 2012. ^ "Peak Average Ratings: 10 year peak range". Archived from the original on 9 March 2012. ^ "Peak Average Ratings: 15 year peak range". Archived from the original on 9 March 2012. ^ "Peak Average Ratings: 20 year peak range". Archived from the original on 9 March 2012. ^ Sonas, J. (2005). "The Greatest Chess Player of All Time – Part II". Chessbase. ^ "Divinsky-Keene rankings". Archived from the original on 26 November 2009. ^ Hooper, David; Whyld, Kenneth (1992). The Oxford Companion to Chess. Oxford University Press. ISBN 0-19-280049-3. ^ Winter, Edward (1996). Chess Explorations. Cadogan. ISBN 1-85744-171-0. ^ "by Charles Sullivan". Truechess.com. Retrieved 21 October 2013. ^ (DanielRensch), Daniel Rensch (24 October 2016). "Better Than Ratings? Chess.com's New 'CAPS' System". Chess.com. Retrieved 17 April 2017. ^ (DanielRensch), Daniel Rensch (3 January 2017). "Who Was The Best World Chess Champion In History?". Chess.com. Retrieved 3 February 2017. ^ Bobby Fischer, "The Ten Greatest Masters in History", Chessworld, Vol. 1, No. 1 (Jan.-Feb. 1964), pp. 56–61. ^ "Fischer's Top 10". Archived from the original on 6 February 2009. ^ Twelve Great Chess Players and Their Best Games, Irving Chernev, 1995 (reprint of 1976 edition). ^ Seirawan, Yasser; Stefanovic, George (1992). "Belgrade; Interview with GM Miguel Quinteros". No Regrets • Fischer–Spassky 1992. International Chess Enterprises. p. 255. ISBN 1-879479-09-5. ^ Gligorić, Svetozar (2002). Shall We Play Fischerandom Chess?. B.T. Batsford Ltd. p. 8. ISBN 0-7134-8764-X. ^ Edmonds, David; Eidinow, John (2004). Bobby Fischer Goes to War. HarperCollins Publishers Inc. p. 310. ISBN 0-06-051024-2. ^ "The most important interviews by GM Vladimir Kramnik, World Chess Champion 2000–2007". Kramnik.com. Retrieved 21 October 2013. ^ "Vladimir Kramnik on Chess, Anand, Topalov, and his future". 31 August 2011. ^ "Aronian names Alekhine best player of all time". WhyChess. 22 August 2012. Retrieved 21 October 2013. ^ https://www.youtube.com/watch?v=WGdywyQlo2E "Well, in my opinion Garry is the strongest player of all time"
^ "Magnus Carlsen: – Jeg tar verdensrekorden – VG Nett om Sjakk". Vg.no. 1 January 1970. Retrieved 21 October 2013.